Click for more data on J.C. Penney stock. J.C. Penney has attracted the attention of some top hedge funds as the retailer struggles to turn itself around. Shares of the troubled retailer have risen 35% over the past month, bouncing off their lowest levels in 33 years. 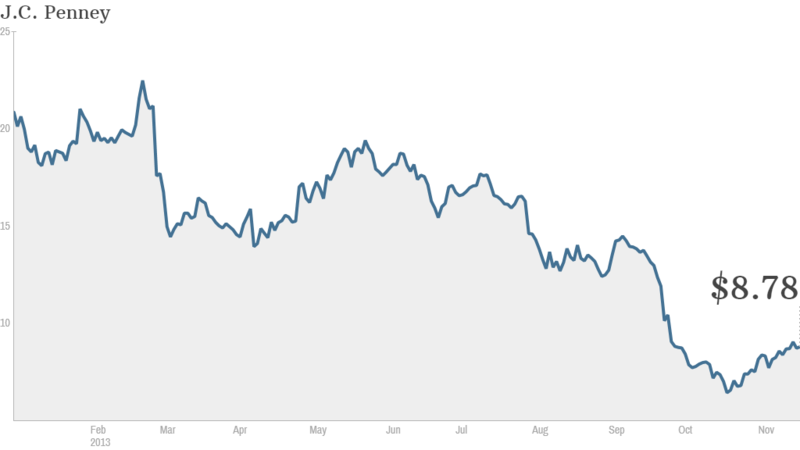 The rebound comes near the end of a brutal year for the company. J.C. Penney (JCP) shares are down more than 50% in 2013, making it the worst performing stock in the S&P 500. Bill Ackman, a long-time investor in J.C. Penney and a supporter of ousted CEO Ron Johnson, cut his losses in August. But the company has recently received backing from some other high-profile hedge fund managers, including George Soros and David Tepper of the hedge fund Appaloosa Management. It's unclear whether these investors are making a long-term play, or just speculating on a short-term recovery in the stock price. But most analysts expect J.C. Penney will report another round of heavy losses when it releases its third quarter results Wednesday morning. Revenue is expected to fall 5% in the third quarter to $2.79 billion. J.C. Penney said earlier this month that same-store sales, a key metric in the retail industry, rose nearly 1% in October. It was the first time same-store sales grew since December 2011, and came after a 4% drop in September. CEO Mike Ullman touted the sales numbers, saying J.C. Penney has made "significant progress" and is on track to "return to long-term profitable growth." But the real test for the company will come in the current quarter, when the all-important holiday sales period begins. Bernard Sosnick, an analyst at Gilford Securities, said sales could increase 10% to 15% in the fourth quarter from a year ago. He acknowledged that J.C. Penney has the benefit of easy comparisons with last year, when fourth-quarter sales plunged. But he said aggressive promotions during Veterans Day weekend earlier this month suggest the company will pull out all the stops for Black Friday. "A good fourth quarter, and Penney is back," he said. Not all analysts are so optimistic. Related: Is J.C. Penney a buy or a sell? "If they don't have a good holiday season, there is no turning the company around," said Paul Lejuez, an analyst at Wells Fargo Securities. Lejuez said he will focus on J.C. Penney's profit margins and costs as the company slashes prices to get customers in the door. Even though sales were up in October, store traffic was still down, said Lejuez. "It makes it look like those customers that left are never coming back," he said. Much of the company's current turmoil stems from the controversial tenure of Johnson, the former Apple (AAPL) retail executive who stepped down in April after his store makeovers and price changes failed to show results. Ullman, who ran J.C. Penney before Johnson, has been rebuilding store inventory and bringing back discount brands such as St. John's Bay. Beyond the company's current troubles, J.C. Penney needs to become more competitive in a market where more consumers do their shopping on the internet. This is not unheard of, however. 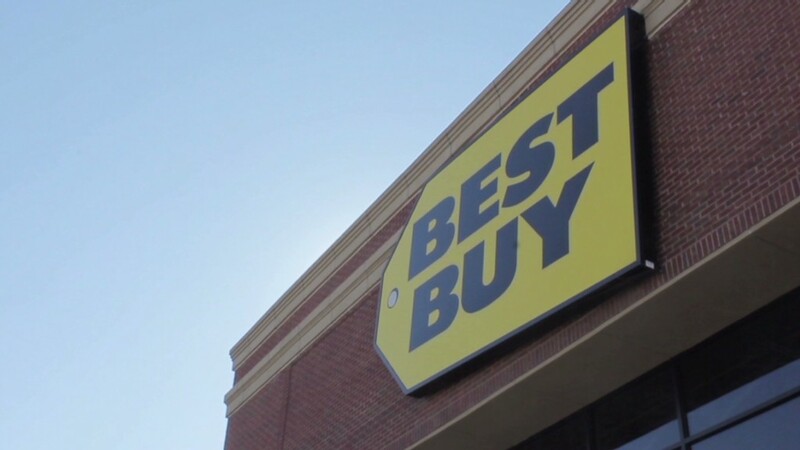 Best Buy (BBY) went through a similar ordeal last year and has emerged in a better position. The electronics retailer's stock has soared this year and is one of the top performers in the S&P 500. Shares fell Tuesday though after Best Buy said that more promotions during the holiday shopping season could hurt its profit margins. But J.C. Penney would still love to be in Best Buy's shoes. It's not there yet though. The first step will be to stem the flow of red ink and stabilize the company. "Right now, we're just talking about pulling the company out of a nosedive," Sosnick said.